Wudang Mountain, in the northwest of Hubei Province, is perhaps the best known of China's Taoist holy mountains. It was listed by UNESCO as a World Cultural Heritage Site in 1994. The main tourist attractions, spread over an area of 300 square kilometers, compose a spectacular panorama of traditional Chinese landscape painting. Known to locals as Taihe or Xuanyue, Wudang Mountain's beautiful scenery o tranquil valleys juxtaposed with precipitous peaks offers three main areas of interest to travellers. The oldest structures date back to 1300, during the Tang Dynasty, and there are examples of architecture from each subsequent dynasty; the Song, Yuan, Ming and Qing. There are altogether 72 temples, 39 bridges, 36 nunneries and 12 pavilions, a statistic that gave rise to the old saying, "a nunnery every ive miles and a palace every mile." The oldest temple, Wulongci (Five Dragons Ancestral Temple) represents the commencement of the promotion of Taoism, hence Wudang is known as the cradle of Taoism. In 1413, Emperor Zhdi of the Ming Dynasty ordered 33 temples to be built within ten years, representing the peak of its development. At twilight at Zixiaogong (Purple Clouds Palace), Taoist monks can be seen walking in the empty square in front of the palace. The master, Guo Gaoyi, a white whiskered and extremely healthy septuagenarian, suggests measures for preserving health, "Practising is to train ourselves and taking care is to protect ourselves. Thee are three kinds of treasure in the universe; the sun, the moon and the stars. Humans also have three kinds of treasure, the vigor, the breath and the spirit. It is important to know how to use them appropriately." 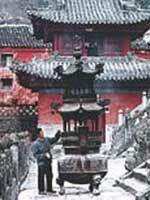 In Wudang Temple, the bell and the drum strike out the time. Every morning, the monks get up at around 5 and assemble in the palace to read Taoist canons, to the accompaniment of Taoist music, then do so again in the afternoon, also singing Taoist songs. At Zixiaogong, there are statues of gods and immortals on the altars, as well as sacred objects and musical instruments. This is where the largest Taoist rite for the saving of the souls of the dead is performed. “You must be a good person before becoming a Taoist,” is the often-heard mantra at Wudang. Taoists should be compassionate, loyal and faithful. Only by becoming a good person can one train oneselto become immortal, it is believed. Wudang kung fu enjoys great popularity, both in China and abroad. According to legend, Zhang Sanfeng, the originator of Wudang quan (taiji) was inspired by a fight he witnessed between a pied magpie and a snake. Wudang quan advocates the cultivation of morality and fostering of nature in conjunction with physical training. The film Crouching Tiger, Hidden Dragon attracted students of kung fu travel from all over the world to study with the masters at Wudang. 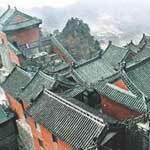 Visitors to Wudang, if they are lucky, will see masters practicing on the roofs of the halls and on the mountain. The Hall of Yuzhen is the cradle of Wudang kung fu. In 1417, Emperor Zhudi decreed Wudang to be the "Grand Mountain" and ordered the construction of the Hall of Yuzhen for Master Zhang Sanfeng. On January 19, 2003, a fire broke out in the hall, reducing the three rooms that covered 200 square metres to ashes. A gold-plated statute of Zhang Sanfeng, which was usually housed in Yuzhengong, was moved to another building just before the fire, and so escaped destruction in the inferno. On top of Nanyan (South Rock) is a stone beam with a dragon carved on it protruding from above the cliff, which attracts many travellers to burn incense on it as a sign of their devotion. The Huanglongdong (Yellow Dragon Cave) is a cave surrounded by Taoist temples and shrines on the way to Jinding (Golden Peak). It is cool and damp, and said to be an ideal spot for meditation. The final ascent to Jinding is a zigzag stone staircase of 212 steps carved into the mountain called Jiuliandeng (Nine Lotus Stairs). Standing on Jiuliandeng, the summit appears to be near at hand, and the mountains surrounding Jinding all seem to lean in towards it. When finally arriving at the top, visitors go through a dark hall called Zhuanyundian (Changing the Fate Palace). Taoists rap on a wooden fish, asking, "have you turned round?" The reply, "Yes, I have," implies that their fate has changed. Upon stepping out of the dark hall, the contrng sunshine is said to symbolize the experience of nirvana and a new life ahead. Step over, not on the thresholds of Taoist temples. Do not point at or turn your back to statues of the gods. There is an old saying in China, "(Buddhist) monks don't tell their names and Taoists don't tell their age." Do not ask the monks how old they are. If you go hiking on the mountain, find a local guide and do not stray too far from the main path. The best times to visit are spring and autumn. Take a train to Wuhan and then transfer to the Wudang Mountain Tourists Train, or take the train from Beijing to Xiangfan and then transfer to Wudang. Alternatively, fly to Laohekou Airport at Xiangfan. China United flight CUA307 departs Beijing at 8 am Wednesdays (580 yuan). From Laohekou, it is 90 kilometers by bus to Wudang.